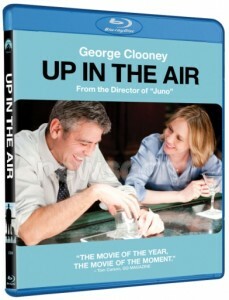 Six-time Oscar nominated film Up in the Air will release on Blu-ray Disc and DVD Mar. 9, 2010. The Parmount film was directed and co-written by Jason Reitman who has been nominated for Best Director, and stars George Clooney, Vera Farmiga and Anna Kendrick, who are also Oscar nominees. Up in the Air has been nominated for the Academy Award for Best Motion Picture in 2010. George Clooney is nominated for Best Lead Actor and Vera Farmiga for Best Supporting Actress. Writers Jason Reitman and Sheldon Turner are nominated for Best Adapted Screenplay. Blu-ray Disc specs include 1080p video at 1.78:1 aspect ratio, DTS-HD Master Audio 5.1. Extras include deleted scenes, storyboard, and directory commentary. See full specs below. • Do You Live At The Hilton?